Detailed iron ornamentation wrought by hand or cast has graced the city since the 1730's in the form of gates, grilles, shutter guards and foot scrapes. A more functional dimension became popular after the infamously unsuccessful Denmark Vesey slave uprising plot of 1822, in which the condemned admitted plans to murder families in their homes. Sharp iron spikes were added to gates and piazzas of downtown residences - a ferrous forerunner to the "Keep Out" sign known as Chevaux-de-Frise. 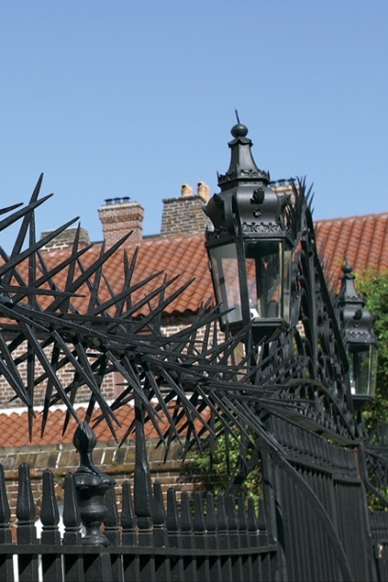 Literally translated as "horses of Friesland", the pointy device was first used by the Dutch to discourage cavalry charges, and is most prominently displayed at the Miles Brewton House on 27 King Street, which reportedly has never suffered a break-in since. Heralded iron works and workers run the course of Charleston's past, including the 1840 St. Michael's graveyard gate created by I.A. W. Iusti, the 1838 "Sword Gates" fashioned by Christopher Werner, and the 1997 "Heart Gate" of Philip Simmons. The Sword Gates are duplicates of those originally displayed at the city Guard House on Broad Street, which today mark the entrance to The Citadel. Charleston's most intriguing iron oddity is the gib plate, a washer and nut assembly attached to building facades typically in the form of discs 12-15 inches in diameter, which anchored internal stabilizer rods. Used to bolster masonry walls in the city since the 1850's, gib plates became such a common sight after the 1886 earthquake that they were soon referred to as "earthquake plates". Several of the stylish homes along East Bay were distinguished by plates made into crosses, stars, and lions' heads, and recent restorations South of Broad have included unattached "faux" plates to surfaces where originals were removed. Architects may dismiss earthquake plates as ineffectual, but they sure shook up the look of historic Charleston's exterior. According to an old Charleston yarn, the best remedy for an extended pregnancy was a ride down Chalmers Street, whose bumpy cobblestones worked their magic enough to earn the nickname "Labor Lane". George Washington's horse carriage apparently labored so much in Charleston streets during his 1791 visit, that our first president bemoaned the city's "unpaved streets of sand", and observed only a handful of solid surfaces in a city interlaced with creeks, marshes and mudbanks. A major change in Charleston streetscapes came from cobblestones that were used as ballast in the holds of colonial sailing ships. These oblong stones were often dumped on city wharves to make more room for valuable cargoes of rice and cotton, offering a new form of landfill. By the 1720's the city had officially gotten into the act, offering sea captains tax-free port visits in return for ballast stones, and by the late 18th century, provided pavement for more than 10 miles of streets. Iron keels would eventually make supply of cobblestone obsolete, and Charleston street paving would change to Belgian Blocks, wooden planks, vitrified bricks, crushed oyster shell, as well as the "noiseless roadway" of creosote-covered blocks laid on Broad Street in 1883 to soften traffic sounds near courts and business offices. 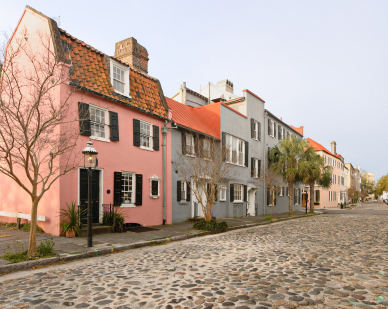 In 1900, cobblestones still covered more than four miles of Charleston's streets, but a paving modernization program begun with asphalt in 1913 reduced that to a handful of minor lanes and alleys, including Chalmers Street, whose surface was so loose and rugged that a 1970's restoration effort was undertaken to level and imbed the stones. The "new and improved" Chalmers Street continues to be a shock absorber challenge that seemed to live up to its nickname when a baby accessories store opened at the end of the street in 2002. Each day on sidewalks and along roadways around Charleston, one of America's oldest cultural traditions is begun from scratch all over again in the form of hand-woven sweet grass baskets. More than a quaint folk-art, the sweet grass basket is an enduring symbol of people's ability to make the most of hardships in life. Weaving skill has been passed down, generation to generation, for more than three centuries among descendants of African slaves, who turned nature's simplicity into lasting function and beauty. Sweet grass gets its name from a pungent chemical in the smooth, slender leaves that, when dried, gives the plant a pleasing smell similar to fresh cut grass or bales of hay. Found in wetland bottoms along the coast, this sturdy, supple perennial sprouts leaves two feet long or more, which are harvested by hand into sheaves that must be completely dried before weaving. Most gatherers spread sweet grass on the ground in thin sheets to dry, but because wind can easily scatter leaves, others prefer heaving bundles on the sloping roof tops of their houses to block wind and get more direct sunlight. Methods of converting sweet grass into baskets are creative and diverse as well, and will usually include additions of bull rush, long leaf pine, and strips of palmetto fronds, known in Gullah tradition as "fan o'metta". Baskets are woven by taking the root ends of the sweet grass or "heads", and tying them into knots, before twisting and wrapping with stitches made from the other binding materials. As more leaves are fed into the weave, baskets begin to take shape in the form of tight coils, wound seamlessly, row by row, in outwardly-radiating spirals. Creating space for each stitch to pass through the ever-increasing coils, weavers use one, basic tool, the "nail bone". Generations ago, this would have been an animal bone, typically from a pig or cow, and occasionally, weavers from the past used nails or pieces of glass. In recent times, the preferred stitch-maker has been a metal spoon or fork broken off at the handle tip and sharpened to a point, as weavers near St. Michael's Church, the old city market or at stands on Highway 17 in Mount Pleasant work wonders with the sawed-off piece of cutlery. And although the weaver's tool may be shiny and silver, it is still known as the nail bone.